Mrs. Rosalyn Poole Farthing, 87, of Dunn died Thursday, January 17, 2019 at her home. She was the daughter of the late Marvin Bailey Poole, M.D. and Lucille Johnson Poole. 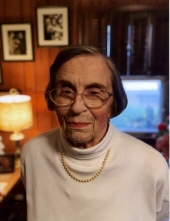 Rosalyn was a 1948 graduate of Dunn High School and a 1952 graduate of Meredith College. She taught school in Columbia, SC, Harnett and Cumberland Counties in NC. Rosalyn, at the age of 10 in 1942, became an active member of Dunn First Baptist Church. She was a member of Thursday Afternoon Book Club since 1955. She enjoyed puzzles, reading, playing bridge, and eating out. A funeral service will be held Saturday, January 19th, at 11 a.m. at Skinner & Smith Funeral Home by Dr. Len Keever. Burial will follow in Greenwood Cemetery. Rosalyn is survived by her husband of 66 years, James “Jim” S. Farthing, Jr., a son, James “Jimmy” S. Farthing, III and wife Laureen of Greensboro, a daughter, Lucille F. Smith and husband Lee of Dunn, two granddaughters; Michelle Farthing, and Whitney Harrison and husband Bobby, a great granddaughter, Piper Smith, a sister, Kimberly P. Tart and husband Stanley of Kernersville. The family will receive friends Saturday from 10 to 11 a.m. at Skinner & Smith Funeral Home. The family asks instead of flowers that memorials be made to, the James S. Farthing Basketball-Baseball Scholarship, Campbell University, Buies Creek, NC 27506 or to the First Baptist Church, 309 W. Broad St. Dunn, NC 28334. To send flowers or a remembrance gift to the family of Rosalyn Poole Farthing, please visit our Tribute Store. "Email Address" would like to share the life celebration of Rosalyn Poole Farthing. Click on the "link" to go to share a favorite memory or leave a condolence message for the family.